Baking bread when I was growing up meant first slipping down to the basement larder and grinding the grain. The machine was absolutely deafening, but I loved the smell of freshly milled flour and the way it floated down to form miniature snowy mountains in my bucket. My mother still grinds her own grains and regales me with tales of her kamut lasagna noodles and soft wheat pizza dough; as always, she’s years ahead of the current whole foods movement. I had quite a few tools and appliances that I needed to invest in when I set up my own kitchen and a grain mill was low in the list. It was there, though, for my ‘someday’. Naturally I was very excited last fall when KitchenAid Canada provided me with a grain mill attachment to go with my beloved 7-quart stand mixer. It’s funny, I feel as though I have both traveled back in time to to that flour dusted larder floor and taken a step ahead into another level of baking with whole, unprocessed ingredients in my kitchen. Why grind your own flour? Most of your fiber, vitamins, minerals and antioxidants are found in the bran and germ of a wheat kernel – but this is the very part that gets removed in processed flours you find in supermarkets. Grinding your own flour ensures that you are baking with the most nutritious product possible. 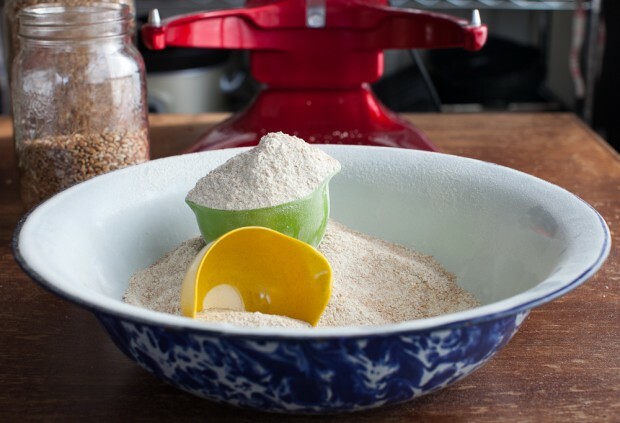 Freshly ground flour contains the natural oils found in the grain which adds a lightness to baked goods that ordinary whole wheat flour does not contribute. As a caution, this also means that the home-milled flour needs to be used up quickly (within a day or two) or kept cold so the oil does not turn rancid. My mother always stored her ground flour in the refrigerator until we pulled it out for pancakes or the daily loaf. Also, price can factor in, especially if you tend to cook with a lot of specialty or gluten free flours. These can be expensive to buy and it’s cheaper to buy the grains and grind them yourself as needed. Whole grains can typically be found at your local heath food store, although I admit, facing the bulk bins for the first time can be a little daunting. I remember whipping out my phone and calling my mother. Yep, I sure did. Um, Mom? Hard or soft wheat? What do I want for my daily loaf? Help! My set up for the actual grinding process is as simple as switching from the whisk to the paddle attachment on a stand mixer. I love how KitchenAid keeps things so user friendly (I’m really not the mechanical type). 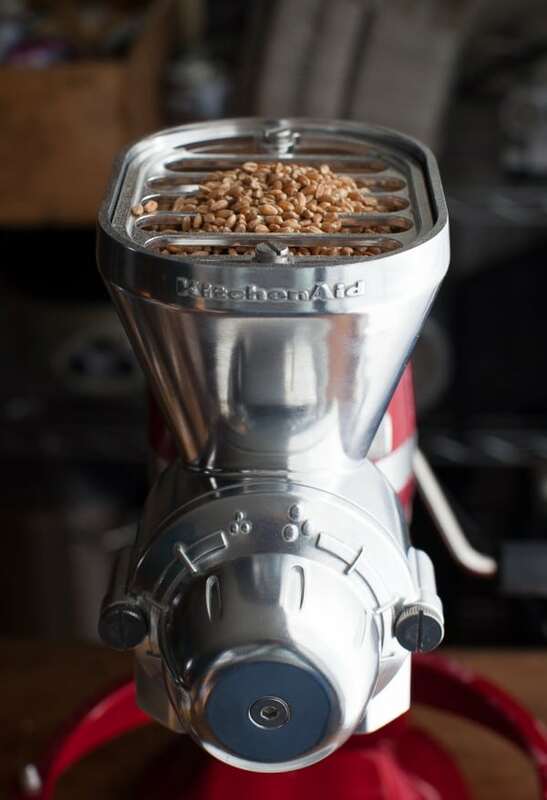 The all-metal grain mill attaches to the mixer and the grain goes straight in the hopper. Place a bowl underneath, plug the mixer in and turn it to maximum speed. Then sit back, watch the flour drift down and breathe in the aroma of freshly ground whole wheat flour. It’s a little bit magical, I have to say. Pros of the KitchenAid Grain Mill attachment. It is small to store. One of the biggest complaints I have heard about stand-alone grain mills is that they are very large (bigger than an average KA mixer, in fact). I just don’t have the space to store another large appliance, which is why an attachment works best for me. It works clean. The grain grinds up with very little dust. It’s quiet. Compared to the deafening noise of most grain mills. It’s user-friendly. As mentioned above. 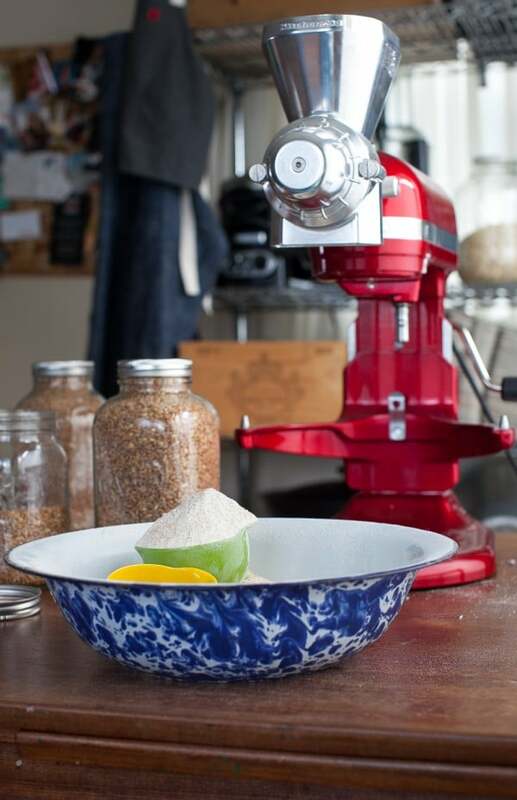 I’ve read a lot of the forums on this particular attachment and there are concern about long-term use of the KitchenAid grain mill as well as wear and tear on the mixer itself. While I can’t speak from experience, my guess is that this attachment is best for smaller batches of flour. My Pro Line 1.3 HP mixer has never even warmed slightly during a grind, but it would be interesting to see how the smaller models held up. We’re not gluten free, low carb or Paleo by any means, but we are eating less and less bread and baked goods. I’m finding that when I do bake, I want to use the freshest, best product I can and for now that means grinding my own grains. I know this attachment is hefty enough to keep up with our weekly demand and I’m looking forward to expanding our repertoire of home ground flours – with my mother’s input of course. KitchenAid Canada has compensated me for my services and my posts, but all posts represent my own opinion. Are you interested in grinding your own grains? 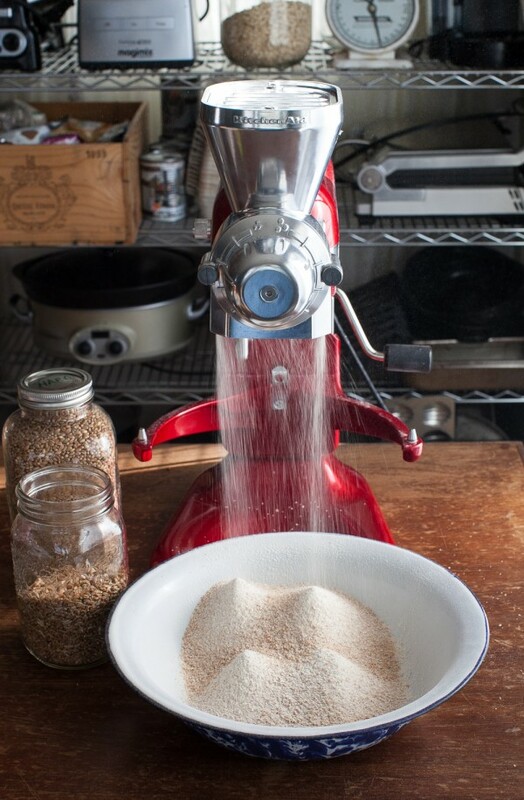 Have you ever ground your own flour? Will you share some recipes? I am guessing that they would be slightly different than merely subbing this flour for store bought. Thanks! When I saw your instagram photo of grain grinding this weekend, I was really hoping there’d be a follow up how-to post – then, voila, this arrived in my inbox! In January I went to started making my own breads, and instantly wrote off commercial bread-buying! I’ve been thinking grain grinding should be my next frontier, so thanks for the grinder recommendation and tips about which grains to use for which recipes. I had maybe seem it in their store. It’s worth checking out at any rate. When I bought my Vitamix blender oh . . . boy at least a dozen years ago . . . it happened to come with a dry blade container for grinding grains. I really bought it to make smoothies, so this was definitely an un-needed bonus that turned into a benefit years later. Every once in a while I come across wheat berries and will grind my own whole wheat flour, though I haven’t found an economical source for them here, and it seems crazy to spend triple the cost (or more!) for berries than for the same weight of flour. Admittedly, I haven’t exhausted my search here in our new home, but Amazon–ouch! I do know my sourdough starter prefers freshly ground flour, and I like to keep my starter happy, so I’ve been grinding at least once a month. I’ve heard good things about the grain grinder on the Vitamix, Kirsten. Any time you can use one appliance for multiple purposes is a win in my books! Hi, I’ve been grinding grain for years and years, but was intrigued by your mom’s ” spelt lasagna noodles…any chance of getting her recipe? You know, I think it is time that recipe was passed down. 😉 I’ll see what I can do! Wow- a lovely article Aimee- so proud of you. This morning I ground spelt and mixed it with ‘light’ spelt [found at health store] and made Miranda’s scone recipe. They are so light and spelt is easily digestable. Both spelt and kamut are ancient grains – kamut is best in pasta and pitas-it is golden and I use it more like hard wheat—spelt I use more like I would use soft wheat—in pastries. 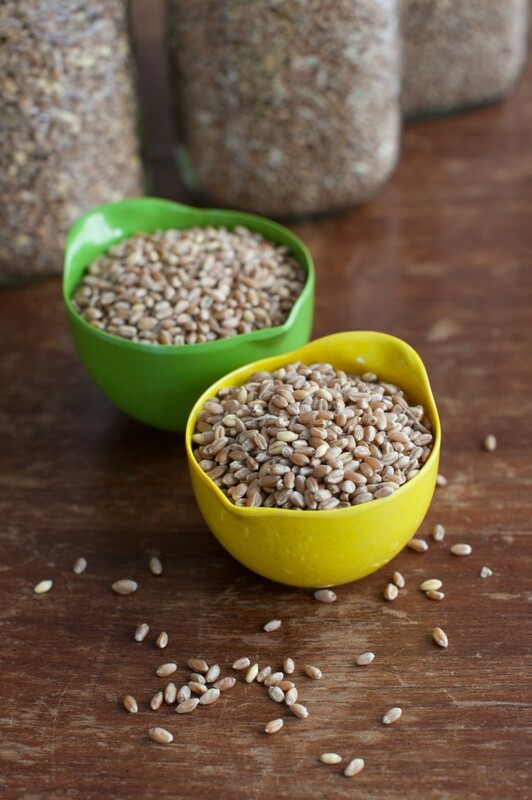 You will get used to the various flavors as you use the grains. I always grind twice as the finer the better. Great article! Is the grinder made of aluminum? Thanks Julie. The grain mill attachment is made of cast aluminum; the shaft is chrome-plated steel. Hope that helps! Re. hard-to-find grains, give the Arva Flour Mill (London, ON) a call. If they don’t carry them, they might know where to source them. They’re my go-to for all sorts of great stuff – and they will send stuff to you. Have fun! wow would i love too! I have thought about it! My Vita Mix has the attachment and I would need to purchase it. But the drawback is fresh bread…my husband thinks it’s necessary to eat the whole loaf fresh from the oven and I don’t think I could keep up with this quirk! I’ve always wanted to try this Aimée, thanks for the review! How is the texture with the KitchenAid? I have been shopping around for a grain mill and currently am just using my BlendTec blender (small batches). I wonder if the grain is fine enough without being too gritty? It’s pretty good, Trisha. My mother recommends grinding twice, so I’ll try that next to see if it makes it even finer. Anyhow, I learned a lot about the science of bread making so decided to start grinding my own grain with my circa 1964 Vitamix. It worked, but wasn’t great for large batches. However, I was smitten so I saved for a mill (wish I’d known about the attachment since I love my Kitchenmaid). LOVE IT! I make a seed and grain bread that is awesome. In fact, I have some rising right now. Must go turn on the oven! Definitely makes you love real food all over again! Thankfulness to my father who shared with mme about this blog, this weblog is actually amazing. Was hoping to find information on grinding without having to buy a big expensive machine! Disappointed. I just bought a grain mill and I am researching for grains that will replace the commercial wheat flour. I love bread and pastries, but I have been diagnosed with beginning diabetes so I am trying to get away from white flour. I am having a little bit of a hard time finding the right grain and some yummy recipes. Help, please!!! You state, “Freshly ground flour contains the natural oils found in the grain which adds a lightness to baked goods that ordinary whole wheat flour does not contribute”. What you’re saying is that producers of whole wheat flour don’t include the germ, or embryo, of the wheat seed. That’s not the case. Spokespeople from both King Arthur and Bob’s Red Mill assured me that the germ is included in their flours. In addition, their products stay fresh on store shelves many months without the use of preservatives. Barb’s Kitchen in Edmonton, Alberta. Mail and bus orders are welcome.